We had a busy day on Saturday. First we played volleyball at North Beach Bar for a few hours. A quick stop at the tailors on the way to pick up Dave's new blazer; it's a great blue and brown corduroy, the nice velvety corduroy, not the kind when we were kids that made the swishy noise when you walked. Clothing materials have come a long way, but there are still great basics out there. Very similar to cooking. It seems like every couple of years there is a much ado about an ingredient that, while it's been around for some time, it's just making it way into the American Culture. Look at Cilantro. it's still riding a wave of popularity. Personally I feel it is completely overrated, overused and overvalued. Don't really care for it either. So when every chef in every restaurant from Thai to Italian started throwing handfuls of the stuff on the plate, I nearly had to start eating at chain restaurants! But lets get back to the basics...bacon! It's one of those ingredients that never go out of style, and you can pair it with nearly everything. I just ran into another bacon lover (at the chili cookoff) who made bacon chocolate chip cookies. Yum! So back to the original story. By the time we made it home it was 2:00 and we were famished. In classic Monique fashion, I quickly assessed what was available and started creating. I don't always know what the end product is going to be until I get there. I had a couple of slices of bacon, some leftover cooked turkey and a couple of fabulous ciabatta rolls from Costco. (I've mentioned before that Costco really does ha ve some nice bread!). The results were eye-opening. Seriously. Dave was half asleep on the couch when I brought him one of the sandwiches. It just lay there as he was too tired to pick it up and eat it. I was moaning and raving about how good it was when he finally asked for a bite (a bite of mine, cuz he was too tired to pick his up!) After one bite he sat up and ate his entire sandwich before I even got a few more bites into mine. The recipe is below; but as always, please adjust according to your tastes. 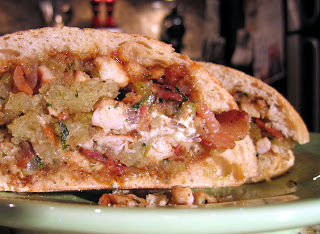 Use chicken if you don't have turkey...but do not substitute the bacon! Place two ciabatta rolls in the oven to warm. Use 4 slices of bacon, medium diced into pieces. Begin sauteeing in a pan. When the bacon is about half way done, add 1/4 cup dice red onion and 1/4 diced celery, continue to sautee for about 4 minutes. (in the bacon grease, do not throw out.) Add 1 cup of diced cooked turkey. Add lots of fresh ground pepper, turn to low to simmer all the juices together. Take the rolls out of the oven and turn the oven to broil. Cut each in half. 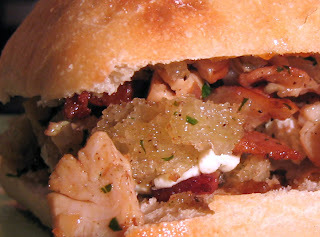 pick out the inside bread, tear into pieces and toss into the pan with the bacon and turkey. Pan toss all the ingredients together a few times. Now fill the scooped out bread roll side with the pan mixture. Top the bottom or flatter side of the roll with a fig jam, (don't skimp), then with Parmesan cheese and top the other 'filled' side with Chihuahua cheese (this is a crumbly Mexican cheese) or use any cheese you have available. Place under the broiler until the cheese is melted. Press the bread rolls together and smash them down a bit the spread all the filling throughout. You will love how the sweet fig jam plays off the bacon, once again proving that bacon is a classic that goes with everything! Enjoy and as always - be fat and happy!